It has been a few years birding up north in the Adirondacks so when the idea began floating around leading to a discussion with my friend Joe Giunta, I was all psyched to do a trip with him. My first trip to the Adirondack was with Joe Giunta in 2010 so it was only fitting that I was returning after a few years of not enjoying any northern birding. Our trip did not get off to such a great start, dipping on a state bird (more on that in another post) which we worked into our trip. Nevertheless, we kept up our spirits and by 3:00 p.m. began our first bit of northern birding in Keene Valley. We thought we might have lucked out with one of our target birds, when a flock of Waxwings popped into view but after pulling over and carefully studying them we were satisfied they were all Cedar Waxwings. Nice to see but they were not the Bohemian Waxwings we wanted. We decided to check in to our hotel and then to hit Bigelow Bog before the light faded. After checking in, we drove to our parking spot near our rooms and heard Pine Siskins. We scanned the nearby Cedars and picked up a mixed flock of Pine Siskins, Purple Finches and American Goldfinches. Nice birds to get anywhere and it lifted our mood. Once our travel gear was off loaded, we were back on the trails again at Bigelow Bog. We immediately picked up a few Purple Finches but the rest of the way, it was quiet; the icy conditions made it quite a treacherous walk so we did not get too far in on the trail. With light fading, we called it a day and headed for dinner. We had gone 0 for 3 but kept our spirits up. Dinner at Nonna Fina was nothing to write home about. Joe seemed satisfied but I had a hard time putting away the "Personal Pizza" we shared. The next day, breakfast at McKenizie's Grill was very good and our hostess, kept our coffee cups filled and often. By 7:00 a.m. we were on the road heading back to Bigelow Road. 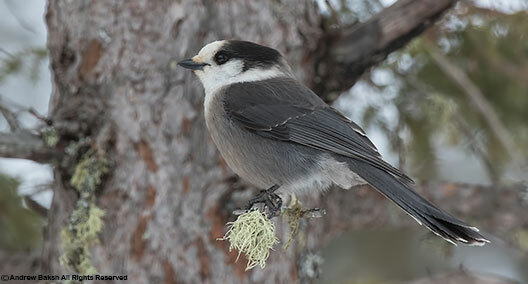 This time we scored quickly and bagged Gray Jays who followed us around on the trail looking for handouts. We had some peanuts which they gladly took. We left Bigelow Bog after trying for and not finding any Boreal Chickadee or Black-backed Woodpecker. Next, we headed to Keene Valley where we decided to drive around in the hopes of running into Bohemian Waxwings. We tried several areas that looked reasonably good but with no luck. I checked in on local reports and mentioned to Joe that Evening Grosbeaks were reported in an area about an hour away. We had decided that we might be better off taking a shot at the Grosbeak area and reluctantly decided that we had dipped on Bohemian Waxwings again. Before heading off, we decided to give one area another crack. We had almost reached the area where we would split off for the drive to the Grosbeak location when I heard Waxwings. I asked Joe to stop the car and strained my ears to listen. At first, nothing and I began to think that I was talking myself into hearing Waxwings, when I heard the sounds again. I quickly tried to get a bead on where it was coming from. Across the road a flutter of wings caught my eyes and I glassed the area. We got Waxwings, I yelled at Joe. As Joe tried to get a look around me through my window, I yelled again. There are Bohemian Waxwings in that flock. We hurriedly parked and scurried over frozen ground, crossed the road and pulled up near a house that had a Mountain Ash Tree with Berries. Frustratingly, by the time we crossed the road the Waxwings were nowhere to be seen but I could hear them. 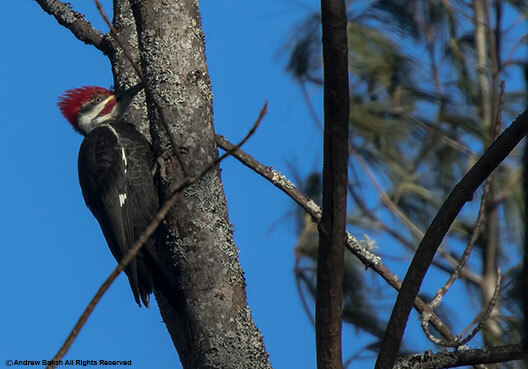 It was Joe who spotted them in a nearby Blue Spruce, they apparently flew up there as traffic went by but came back to the Mountain Ash Tree shortly after. The home owner who is bird friendly came over to chat and extended an invitation for us to spend as much time on his property. 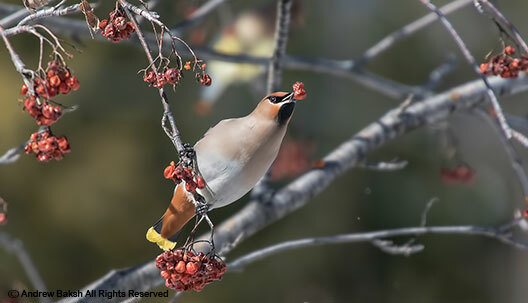 I love the generosity of nature loving people and I love Bohemian Waxwings. Joe was patient with me and I eventually very reluctantly pulled myself away after getting in a rather extended satisfied view. I could have stayed there much longer. We had scored a big one, talk about luck! The rest of the day did not work out well bird wise but we did great with people. We dipped on Evening Grosbeak but met Paul whose Intel sharing led us to Lynn who was radiating with positive energy--a very kind soul. We were invited into her home and she made tea and coffee for Joe and I. Her bird feeders setup was amazing and we were invited to roam her property to look for birds. It was a very cold morning so Lynn's hospitality was spot on and we sipped Coffee and Tea and watched birds coming to her feeders. We were not doing great with the birds but when it came to people, we had struck gold! After warming up, we decided we had taken up enough of Lynn's time and decided that we would take a run at Paul Smith's VIC. I got to be straight, I was thinking we should bird somewhere else but went along with the plan anyway. It turned out to be a rather wasteful drive to Paul Smith's VIC (Visitor's Interpretive Center). I have not had much luck in the past few trips there and this trip was no better. It was a short visit and we quickly headed back to Evening Grosbeak searching but had no luck. We did visit Lynn again and met her husband John who was just as welcoming and shared his stories of nature encounter. These are my kind of people, I could have stayed up there much longer. We were up early, had a quick breakfast, checked out and hit the road. We had decided to try Sabattis Bog again after deciding to adjust our plan to once again make a run at the rare bird we had dipped on during our inbound ride up north. Sabattis Bog, again proved to be tough for us but with time running out on we managed to pull out Red Crossbills. It wasn't easy leaving but we had to finally bid the Adirondacks farewell. As with any trip up north, you head there with a target list of birds and hope to get as many as you could. We had missed a few but neither of us were complaining, we had a couple of nice days birding up north, met some very nice people and we did see some neat birds. The trip in my opinion was a success. Next stop Ulster County. 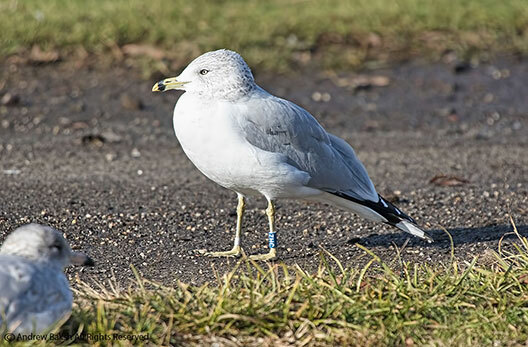 On December 7th 2015, I documented a banded Ring-billed Gull at Flushing Meadow in Queens. After submitting my report to the banding station in Quebec Canada where there is an ongoing research program on the ecology of Ring-billed Gulls. 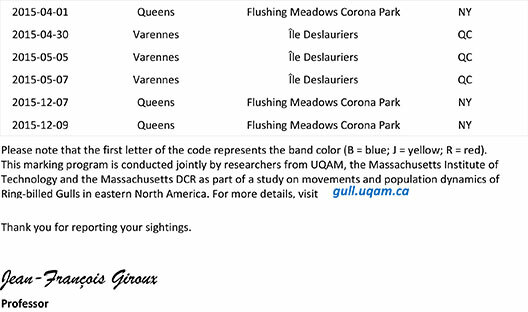 I received word from Professor Jean - Francois Giroux who sent me information about band BZHC. 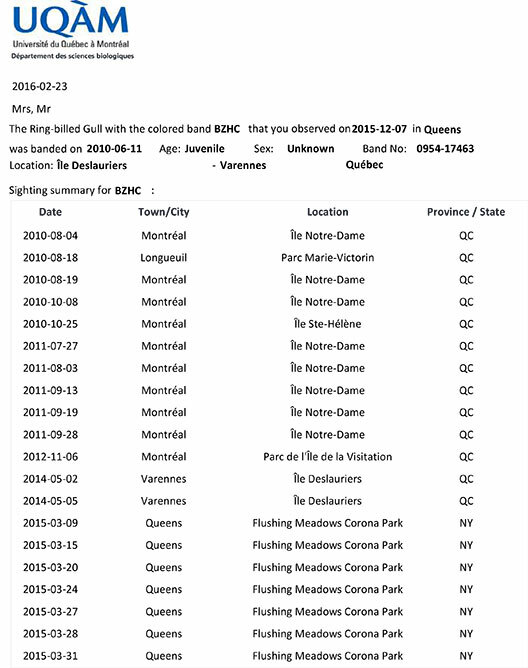 This is the first time I have seen this many re-sight entries for a RBGU (Ring-billed Gull) an encouraging sign that more observers are submitting their reports.